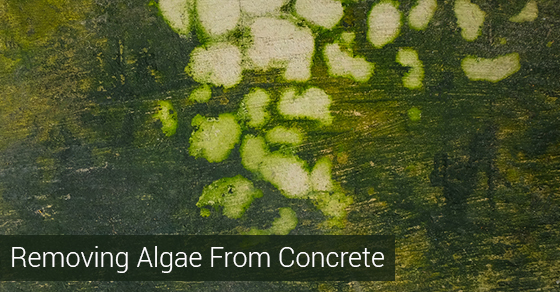 Some estimates say that there are at least 350 million kinds of algae, most of which are located in the oceans—but some algae can even grow on concrete, as long as the conditions are damp. Algae removal is slightly tricky compared to other types of messes you might deal with, but using the right tools, the clean up is simple. All three types of growth can thrive in similar environments, so it’s not always enough to guess what kind of plant you’re trying to remove. Moss resembles a typical house plant the most, in that it has stems and is structured—in fact, it’s almost like a plant with feathery leaves. Mold can be greenish, but it’s also, black, white, red, or yellow. Algae is amorphous and usually a deep green, but the telltale sign is that it looks slimy when wet and it’s slippery to the touch. Because algae doesn’t grow like a weed, it won’t have stems or roots. But, it’s still tough to remove manually. Algae attaches itself by a type of bioadhesive, and it proves to be very sticky. In nature, algae has to cling strongly to hard surfaces as it lives in places where water is constantly moving. A pressure washer directs a powerful stream of water that will easily loosen the adhesive from the concrete, and can cover a large area very quickly. Normal pressure washers that can be purchased, borrowed, or rented for residential use will often be in the range of 1500 to 3000 PSI, which is more than enough for the job. You will need an outdoor connection to power and water. Before you start, adjust the water pressure on a test patch on a discrete part of the wall to see if the concrete can withstand the water pressure. Oxidizing bleach is considered a safer alternative to non-oxidizing bleach because in place of chlorine, the active ingredients in oxidizing bleach commonly are hydrogen oxide, sodium percarbonate, or sodium perborate. When bleach comes into contact with the algae, it immediately starts to kill the cells. You will need a large scrubbing brush to remove the plant matter, but it should come off after some vigorous cleaning. If you have a large area of concrete wall to clean, it’s significantly easier to do with a pressure washer, but even so there will be much debris to clean up after. If possible, ask a friend to help, or find a professional who knows what to do every step of the way. Spring Cleaning? What about Winter Cleaning?